Is this tooooo stinkin' cute?!? Adorable stamp set from Simon Says Stamp. When I saw it released a couple of weeks ago, I immediately thought...No! The word Work Out is just cruel and my old body before its time (it really is the meds I have to take), doesn't get much exercise beyond walking the treadmill. However..... 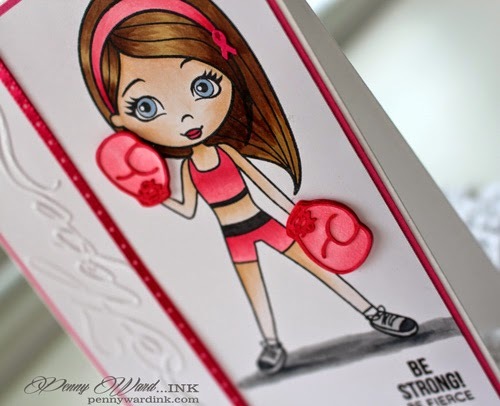 I loved the image of the girl with dumb bells and the sentiments were quite cute and most of them would be appropriate for Breast Cancer Encouragement cards, which I make and give to women at Club Chemo (ok, ok, it's the Oncology center but Club Chemo sounds more fun). I stamped the boxing gloves, used Pixscan in my Silhouette software and made die cuts out of them. In love with my Pixscan...you can take any stamp, make a cut file and size it however you like. Used a little Hope for the embossing and the Silhouette for that tiny 1/4 inch awareness ribbon on her headband. Just as a service announcement: Have you done your self breast exam lately? No....while you are in the shower tonight think of me and this card, do the exam...it might just save your life! 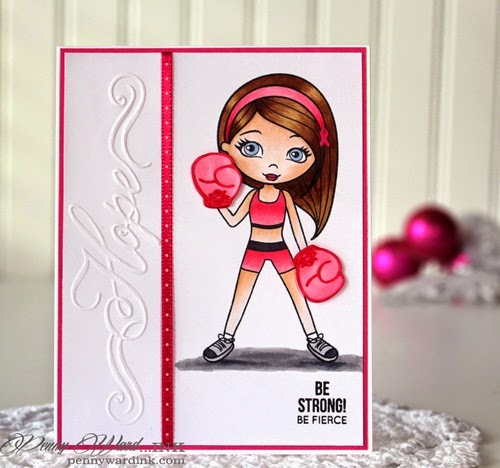 Simon Says Stamp Wednesday - Things that Fly (since I added the boxing gloves, I consider that fists can fly while fighting)...hehehe! Penny - Let me shout YES from the rooftops - THIS IS STINKING CUTE!!! What an amazing card of encouragement to someone at Club Chemo!! Just to let you know - surgery went well, and I am recuperating quite nicely!! 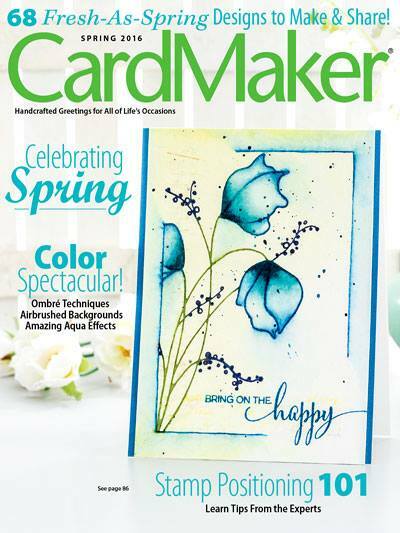 Thanks for being such a great bloggy friend and for being such an inspiration to me of the reason cards matter!!! You are awesome!!! hello Penny! super cute card, your coloring is amazing! I am so glad you played along with Simon Says Stamp Wednesday Challenge!